When trying to teach your child about God, prayer is always one of those areas that are at the top of the list. There are so many ways to engage your son or daughter in prayer. One fun way to do so is through reading books. 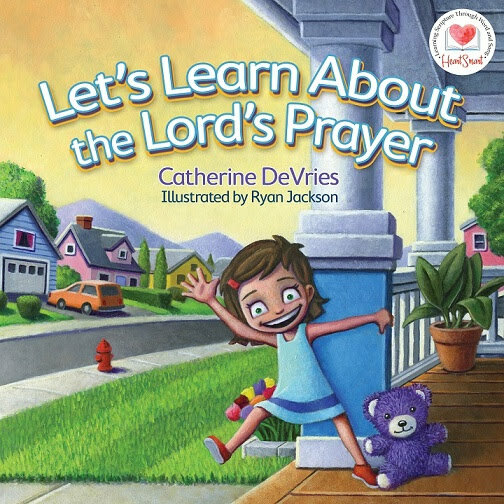 I was recently introduced to a new children's book, Let's Learn About the Lord's Prayer, which actually does just that. Young readers can join a sweet little girl, Emma, on a playdate at her house. While there, Emma is anxious to show readers her room, her favorite toy, what she is eating for lunch, and you guessed it – the Lord's Prayer. HeartSmart is a Scripture memory series designed to create opportunities for children to fill their heart with God’s Word. HeartSmart combines key Scriptures with songs, giving parents a spiritual formation path for building a strong foundation of faith. Let's Learn About the Lord's Prayer is written in such a way that the main character, Emma, is speaking directly to the reader, asking questions about their age, favorite food, etc. This offers children an engaging and interactive experience right from the start. The book also includes colorful illustrations that are sure to delight your little reader. Since it's part of the new HeartSmart series, you are able to go online to access a free custom song featuring the Lord's Prayer that goes along with the book. I really appreciated that the publisher, David C. Cook, offered that feature, since it really sets this particular book apart from others, offering an even more enhanced learning experience. One of my absolute favorite aspects of Let's Learn About the Lord's Prayer is that it actually breaks down the Lord's prayer into small parts, so little one's can understand what it truly means. Emma will first give an introduction prior to saying each sentence in the prayer. We need God's forgiveness when we do wrong, just like we need to forgive other people who do wrong things to us. Let's Learn About the Lord's Prayer is a sweet book that does a wonderful job at not only teaching preschoolers how to say the Lord's Prayer, but also helps break down what each sentence means. This in turn helps give your child a better understanding and shows them the true importance of this prayer. Wanting to help my son develop a relationship with the Lord by incorporating prayer and early teaching of scripture, I really appreciate this book and the unique learning experience it offers to young readers. I also look forward to reading future books in the HeartSmart series.